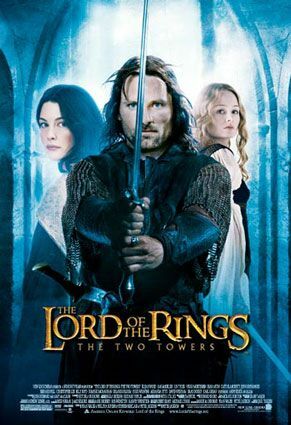 The Lord of the Rings: The Two Towers – Did You See That One? The Fellowship of the Ring has been divided. As Frodo (Wood) and Sam (Astin) make their way towards Mordor they’re joined by an unlikely companion. Meanwhile the rest of the fellowship has suffered a number of losses as they seek aid from Rohan in their battle to save Middle Earth. After establishing the world of Middle Earth with The Lord of the Rings: The Fellowship of the Ring, director Peter Jackson (King Kong (2005)) was faced with bringing the second chapter of the story to life. This time he brought back Fran Walsh (Dead Alive) and Philippa Boyens (The Hobbit: An Unexpected Journey) and added Stephen Sinclair (Meet the Feebles) to the writing team. This film would earn an Oscar nomination for Best Picture in addition to five other nominations that resulted in two wins. The film brings back many of the talented actors from the first film. This includes Elijah Wood (Eternal Sunshine of the Spotless Mind), Ian McKellen (X-Men: Days of Future Past), Orlando Bloom (New York, I Love You), Sean Astin (Rudy), and Cate Blanchett (Blue Jasmine). The cast also includes Sean Bean (National Treasure), Christopher Lee (Hugo), Ian Holm (Ratatouille), Andy Serkis (The Prestige), Viggo Mortensen (The Indian Runner), Liv Tyler (Empire Records), John Rhys-Davies (Raiders of the Lost Ark), and Hugo Weaving (Captain America: The First Avenger). This time the film adds new faces like Miranda Otto (The Thin Red Line), David Wenham (Public Enemies), Brad Dourif (One Flew Over the Cuckoos Nest), and Bernard Hill (Titanic). It took a really good film to follow up on the success of The Fellowship of the Ring. Luckily the writing continued to deliver with a nice second chapter to the epic trilogy. The major success of this film came with the division of the Fellowship. The writing allowed each of the different story lines to stand out and shed further light on the many characters in the story. The film continues the nice dialogue that mixes in enough comedy to make sure that this doesn’t get too dark. The film also pushes the plot along at a great pace. With the multiple stories being told this doesn’t seem to linger too long on any one sub-plot. The writing also does a good job opening up the multiple layers of the main plot. They were able to darken the story in all the right ways, and keep the right amount of tension and suspense within the story. Like the first film the writing also found a great place to stop. While it leaves a lot of unanswered questions, this film doesn’t cut things too short or push too long. There’s very little I could say about the acting that wasn’t covered in my review of the first film. One of the better decisions made during production was to combine principal shooting of all three films into one long run. This must’ve been incredible taxing, but it also helped to keep the actors focused on their characters. This clearly helped to create some of the more intricate details in every performance. The cast also found some new additions with Miranda Otto, David Wenham, Brad Dourif, and Bernard Hill. Each of them seamlessly blends into the story, and finds the right connections with the other actors in the film. This film also features a step up in the performances of Sean Astin and Elijah Wood. Their chemistry continued to develop in their scenes together in this one. In addition, each of them worked nicely with a number of increased emotional and physical demands. The physical demands didn’t stop with these two. Filming included some tough action sequences that injured several of the principal stars. Viggo Mortensen and Orlando Bloom both sustained broken bones during shooting. In addition, Bernard Hill and Viggo Mortensen were both injured during shooting of one of the battle scenes. Despite all of the challenges, the cast came together and delivered a great collective performance. The film is a continuation of the visual success of the first installment. The use of digital effects, models, miniatures, and all the other aspects come together seamlessly. Much of the success of this movie come from the believability of the visuals. In recognition of the work, this movie won Best Visual Effects at the Academy Awards. There was a lot of work that went into the was this movie looks. The film was also nominated for Best Art Direction and Best Film Editing. Luckily, looks weren’t the only success from the production of this movie. The film was also nominated for Best Sound and Best Sound Editing, winning the latter. The score for this film is a continuation of the great work from Howard Shore (Panic Room). Overall, this one found all the right people to execute Jackson’s vision. It’s important to recognize the great talents of the digital effects team that designed Gollum. This is one of the central characters in the film, and he’s perfectly worked into the visuals. The company Weta Digital doubled the size of their staff to handle the challenges of this movie, including Gollum. Their work shouldn’t be ignored since it’s a make or break aspect of the movie. (In total, the company produced more than 73 minutes of effects in over 799 shots.) Andy Serkis lent his great voice work to the Gollum, and one of the more sympathetic, pathetic, and devious characters of the film was born. It’s worth watching this film just to see Gollum. This is one of the rare occasions where the middle film in a trilogy works as well as the first one. (See The Godfather – Part II if you’re not sure if another example exists.) For fans of the first one, this was the perfect followup. Like the other films in the series, I highly suggest watching the extended version since it covers a lot of great ground in the epic story. I wouldn’t suggest this to anyone who hasn’t seen the first film. Unlike Rocky or Indiana Jones this one requires the first movie to allow you to understand the bigger picture. I give this one 4.6 out of 5 stars. Pingback: The Lord of the Rings: The Return of the King | Did You See That One?